I don’t study the pseudosphere in my research, and I can’t say I have a lot of intuition about it; in fact I don’t especially like the thing. So why did I choose it to visually represent what this blog is about? I’ve partly answered this question already by calling the shape a wizard’s cap. After all, wizards are a staple of fantasy literature, and these essays are about math as a form of magic, taking place in a domain where the sorts of miracles of transformation that occur in fantasy actually happen and actually matter. 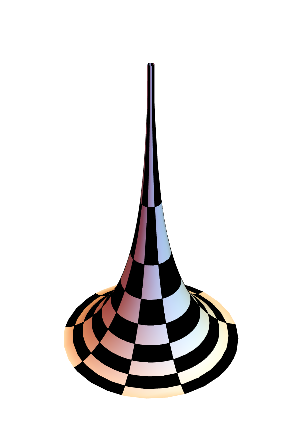 But if the pseudosphere were merely the most famous example of a mathematical surface that looks like a wizard’s cap, I wouldn’t have picked it. I saw my first pseudosphere in the early 1970s in some higher-math-for-the-public book, in a discussion of non-Euclidean geometry. The author described a trinity of two-dimensional geometries: Euclidean, Riemannian, and Lobachevskian. Euclidean (think: vanilla) geometry was the familiar geometry of the plane, Riemannian (chocolate) geometry was the geometry of the sphere, and Lobachevskian (strawberry-ripple-crunch) geometry was the geometry of the pseudosphere. The whole thing confused me. (It didn’t help that Euclidean, Riemannian, and Lobachevskian geometries were also called parabolic, elliptic, and hyperbolic, respectively, even though there were no parabolas, ellipses, or hyperbolas in sight.) I also remember the book mentioned something called curvature, which could be positive (for the sphere), zero (for the plane), or negative (for the pseudosphere), and that confused me even more. 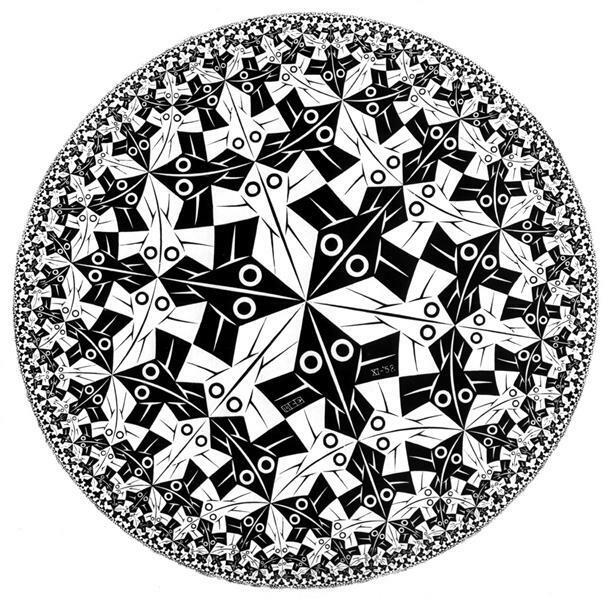 I’m not going to talk about curvature today, or the exact shape of the pseudosphere, because to a large extent the pseudosphere has been displaced by better ways of getting a handle on hyperbolic geometry (such as Escher’s sketches), better suited to the human imagination. And my real themes today are the imagination, math, and meaning. But how did we get to the modern state of affairs, where these three concepts are locked in a very specific sort of embrace? The pseudosphere is part of what got us here. Euclid based his theory of plane geometry on five axioms (such as Axiom 2: “Any straight line segment can be extended indefinitely in a straight line”). Later on mathematician David Hilbert realized that Euclid’s system is missing a few axioms conveying properties of the plane that were as invisible to Euclid as water is to a fish, but since it took many centuries for anyone to notice the gaps let’s not dwell on that. The most notorious of Euclid’s axioms is the ungainly fifth, known as the parallel postule postulate. I really did find myself typing “postule” rather than “postulate” as I typed the preceding sentence, and I guess part of me was thinking of the word “pustule”, which would be appropriate because for centuries mathematicians picked at the parallel postulate the way you might pick at a skin-growth. In comparison with the sleek first four, Euclid’s fifth axiom, featuring three lines and a whole bunch of angles, was an ugly thing — it seemed like something that should be derived from more basic notions, not elevated to the status of an axiom. (The Greek word “axiom” has connotations of worthiness and value.) Modern writers usually replace Euclid’s version of the parallel postulate with John Playfair’s streamlined version, which features one line and one point and then one more line: “Given a line L and a point P not lying on L, there exists one and only one line through P parallel to L.” Many smart people labored to derive the parallel postulate from the first four but were unable to do it. We now know (and indeed have known for over a century) that their efforts were doomed to failure, but to see why, one needs to shift one’s view off to the side. To illustrate what’s involved, we may imagine two extremely different attitudes toward the relationship between words, reality, and meaning. Embodying one attitude we have Abraham Lincoln, who famously asked “How many legs does a dog have if you call a tail a leg?” and provided the answer “Four”, with the justification “Calling a tail a leg doesn’t make it one.” At the other extreme we have Lewis Carroll’s Humpty Dumpty, who said “When I use a word it means just what I choose it to mean — neither more nor less.” Lincoln seems astute and Dumpty seems asinine, but we need some of the flexibility of the latter to help us see why the parallel postulate can’t be derived from Euclid’s other axioms. Specifically, as we’ll see (though not in full detail), it’s helpful to reinterpret the fundamental terms of Euclidean geometry — point, line, parallel, etc. — replacing them by other terms — point-on-a-pseudosphere, geodesic-on-a-pseudosphere, nonintersecting, etc. (A geodesic on a surface is the quickest way to travel from one point to another without leaving the surface. For instance, the quickest way to travel from New York City to Madrid is not along a latitude circle, but along a path that bends a bit to the north in the middle.) If we reimagine geometry in this Humpty Dumpty-ish way, then the dumptified versions of Axioms 1 through 4 are true statements while the dumptified version of Axiom 5 is false. So logic alone can’t get us from Euclid-minus-the-parallel-postulate (also known as neutral geometry) to the parallel postulate. Some readers of an earlier version of this essay found the previous paragraph unclear, so let me offer an analogy with algebra and word problems. This analogy will be helpful later too, so I’ll set up two scenarios, even though the first (and more realistic) scenario won’t show its relevance to my themes until a bit later. In the first scenario, a teacher has six pencils and four pens on her desk, which inspire a math problem she gives her students: “I have two more pencils than pens. I have ten writing implements (pens and pencils) in total. Prove that I have six pencils.” This is ordinary math. You let A be the number of pencils and B be the number of pens, and encode your knowledge in the equations A−B=2 and A+B=10, which you proceed to solve by algebraic methods that don’t depend on the meaning of A and B but only on the two equations (more about this “irrelevance of meaning” later). In the second scenario, the teacher crafts a different problem: “I have two more pencils than pens. Prove that I have six pencils.” You rightly complain that she hasn’t given you enough information to prove the claim. To convince her of this, you can describe a possible world (one in which she has five pencils and three pens, say) in which she could truthfully assert “I have two more pencils than pens” even though the number of pencils in that world is not six. Now let’s go back to geometry. Euclid never asked anyone to use the first four axioms to prove the fifth, but if he had, would that have been a fair homework assignment? To show that Euclid’s first four axioms don’t provide enough information to decide how many parallels there are (too few, too many, or just the right number), one way to proceed would be to describe a possible world in which Euclid’s first four axioms are true but the fifth is false. But it’s hard to find such a world, because our world, which seems to be very close to Euclidean, is all we’ve got! So something else is called for. And that’s where the subversion of meaning can play a beneficial role. After attending a lecture on geometry in which geometer Hermann Wiener proved some theorems of Pascal and Desargues, Hilbert remarked that in a valid proof of a theorem of geometry, one should be able to say tables, chairs, and beer mugs in place of points, lines, and planes. In saying this he certainly didn’t mean to suggest that, for instance, every table has infinitely many beer mugs (much as it might be nice to inhabit such a world). What he meant is that if the Wiener’s proof were valid, then Hilbert’s beer-themed version of the proof would be a logical deduction of beery versions of the theorems of Pascal and Desargues from correspondingly beery versions of Euclid’s axioms. After all, once one accepts axioms as true, mathematical argument becomes conditional argument, more about entailment than absolute truth. If that point seems obscure, perhaps the algebra analogy will be helpful here. When you’re trying to solve the system of equations A−B=2 and A+B=10 (from the first pens-and-pencils scenario), the methods of proof don’t depend on the meaning of A and B. A valid solution remains valid if, in the statement of the problem and in the solution, we replace “pencils” by “tables”, “pens” by “chairs”, and “writing implements” by “pieces of furniture”. Something analogous happens in geometry. The forms of reasoning used in geometry are different from the ones found in algebra, but in both cases, when the reasoning process is sufficiently formal, meanings become irrelevant. Or rather, the meaning of the concepts is irrelevant to the validity of a proof (even if meaning and intuition are often crucial to finding a proof in the first place). But I’m glossing over something important: there’s a huge psychological difference between replacing words by other words and reinterpreting them. That is, it’s one thing to replace “line” by “geodesic” in trying to reason metamathematically about what can or can’t be deduced from Euclid’s first four axioms, but it’s a different and madder thing to say “line” but to mean “geodesic”. And it’s certainly a confusing thing to do when one is talking to other people! But what if one embraces this madness in the private confines of one’s own mind? What if one merely reads “line” and thinks “geodesic”? Can any good come of this sort of double-think? In fact, I know of at least one mathematician whose mental health would have been improved by exactly this sort of double-think. Young János Bolyai, one of the creators of hyperbolic geometry, drove himself half-crazy trying to figure out the properties of non-Euclidean geometry while drawing diagrams on non-non-Euclidean paper. (His own father Farkas, who like Janos had fallen for the siren song of alternate geometry, wrote him a touching letter, saying “For God’s sake, I beseech you, give it up. Fear it no less than sensual passions because it too may take all your time and deprive you of your health, peace of mind and happiness in life.”) If only János had taken a step back from his five axioms for hyperbolic geometry (four from Euclid, one not), and said “These axioms don’t seem to be good descriptions of my diagrams; what are they good descriptions of?”, he might have led himself to the insight that the geometer Eugenio Beltrami came up with half a century later: the axioms of hyperbolic geometry describe the behavior of geodesics on surfaces of constant negative curvature, such as the pseudosphere. Bolyai needed to relax the bond between words and their meanings, to see whether some other meanings might provide a better fit. By showing that hyperbolic geometry was a valid description of surfaces of constant negative curvature, Beltrami showed that the axioms of hyperbolic geometry were logically consistent. This result had far-reaching consequences. For one thing, it gave the mathematical world one of its first great metamathematical results, namely, the fact that the parallel postulate can’t be derived from Euclid’s other postulates. But it had implications for philosophy as well. Some philosophers thought that the Euclidean structure of space was an inevitable consequence of the nature of thought; a non-Euclidean universe was inconceivable! After Beltrami’s work, and Hilbert’s exposition of it, this idea was toast. Hilbert and his contemporaries quickly took a fruitful step beyond Beltrami: they came up with other models of hyperbolic geometry in which a particular path joining two points isn’t considered a “line” because it’s the shortest way to get from A to B, but by a sort of fiat. That is, they realized that if you’re trying to find meanings that match a bunch of axioms, you don’t need to capture all the original intuitions that led to those axioms. Is a line going through A and B supposed to be the shortest distance between two points? That isn’t one of Euclid’s first four axioms, so if you’re hunting for meanings that embody those axioms, you don’t need to worry about that. Or rather, you can worry about it after the fact; if you’ve got a model for Euclid’s first four axioms, you can figure out what distance “ought” to mean for that model as an afterthought, rather than a precondition. For instance, take Felix Klein‘s model of the hyperbolic plane. The points of this geometry are points strictly inside a circle C, and the lines are chords with the endpoints omitted. Properly interpreted, this is a model of hyperbolic geometry. You might think that it fails Euclid’s Axiom 2 (“Any straight line segment can be extended indefinitely in a straight line”), but that’s because you’re using the wrong notion of “indefinitely”. When Euclid wrote about extending a line segment PQ, he meant constructing equal-length segments continuing onward from Q, that is, segments QR, RS, ST, etc.) And we can do this in the Klein model: the points R, S, T, etc. approach but never reach the bounding circle C. It may seem to us that they get closer to each other as they approach C, but don’t trust your lying Euclidean eyes; in hyperbolic geometry terms, the line segments PQ, QR, RS, ST, etc. are all congruent and have the same length. You’re probably thinking “Wait a minute; those points P, Q, R, S, T, … are getting closer and closer to some point (call it X) on the bounding circle C; how far is that point from P and from all those other points sneaking up on X?” And the answer is “X doesn’t correspond to any actual points in the hyperbolic plane; only points strictly inside the circle do.” One might say that from the point of view of an observer living in the hyperbolic plane, the circle C is infinitely far away, and exists only as an idealization analogous to the points at infinity in projective geometry. I actually prefer a slightly different model of the hyperbolic plane due to Henri Poincaré. Now the “straight” lines are circular arcs that meet C at right angles. This is the model that governs Escher’s Circle Limit prints. It may seem that the critters are getting smaller as they approach C, but that’s just a trick of “perspective” (that is, of trying to model non-Euclidean geometry with Euclidean geometry). If you lived in the Circle Limit world and carried around a measuring stick, you could verify that the critters are all the same size (though to people in Euclidean space viewing your world through Poincaré’s portal it would seem that your measuring stick was changing size). Eventually Hilbert’s way of thinking led us to the modern point of view about axioms and models. Models are helpful in shaping intuition, and they reassure us that our axiom-systems are consistent, but no single model is necessarily better than the rest, and certainly no model is “the” right one. Axioms are seen as being curiously similar to definitions: the axioms of Euclidean geometry, taken as a package, are seen as true by definition because they have become constitutive of what we are talking about when we talk about Euclidean geometry. The same is true for the axioms of hyperbolic geometry. Those axioms are true assertions about something different than what the axioms of Euclidean geometry are talking about. Mathematicians create their own mental universes, after all; maybe there is not so much difference from an algebraist beginning a lecture with “Let G be a group” and the God of Genesis saying “Let there be light”. The second statement, we are told, called light into existence in the real world; the first calls a group into existence in the mental universes of the lecturer and audience. Out of nothing I have created a new universe. Bolyai gave us more than merely a new universe: by his example, he helped establish the building of new universes as a respectable thing for mathematicians to do. As a pure mathematician, I spend much of my time traveling the empty space between the world and the mind, where words and formulas and such things live and rule. And my sheepishness about being paid in the real world to explore imaginary worlds is alleviated by the knowledge that the forms of thought that pure mathematicians like me create often turn out to have implications for the real world, though not in the domains one might have originally guessed. to admit for it the necessity of a new order of entities and concepts. And Beltrami succeeded at what he tried. But the mystics won the day, and I think it’s in part because there was a period in time between Bolyai and Beltrami, when hyperbolic geometry seemed like nonsense before it became understandable. This precedent gave nonsense new respectability; a self-consistent form of nonsense could just be a form of sense that hadn’t found its Beltrami yet. So thanks, pseudosphere. You’re still my least-favorite model of hyperbolic geometry, but I appreciate the role you played, paving the way for the others. I’m all for sense-making in the teaching of mathematics, but when it comes to making new mathematics, I’m a deep believer in the value of nonsense, because nonsense is often sense-in-the-making. When mathematical language has been made so abstract as to seem empty of meaning, we open ourselves to new things that the language might mean. When we reduce math to its bones, those bones have a way of growing flesh, and sometimes it’s not the old flesh but a new kind of flesh never seen before. Though, now that I reread this metaphor, I think there’s something backward about it. I don’t see hyperbolic geometry as a skeleton that can grow different sorts of flesh; I think I see it as something more like a spirit that can inhabit different bodies. The “bodies” here are the different models, but the “soul” transcends them, with a logic and life of its own. For me, sense (predictability) and nonsense (surprise) engage in a never-ending dialogue. When an avenue of mathematical inquiry has too much of one or the other, I tend to lose interest. What I love is walking with one foot on each side of the line. Show me something that seems like nonsense and let me puzzle over it for a bit and then show me why it actually makes sense, and you’ll have me hooked. And then I’ll try to build on what you’ve done, pushing your idea in some direction that makes no sense to either of us, but must make some sort of sense because of the way it coheres. And then together we can try to make sense of it. And so on, extended indefinitely. Thanks to David Corfield, Tom Duff, Sandi Gubin, Michael Kleber, Steve Lucas, Keith Lynch, Henri Picciotto, Shecky Riemann and Rich Schroeppel. Next month (December 17): The magic of nine. Stance and distance in popular writing about math. #2. It’s ever-so-slightly wrong to think of Riemannian geometry as being the geometry of the sphere. If you think of “point” as meaning “point on a circle” and “line” as meaning “great circle“, then a pair of lines meet not at one point but at two points, antipodal from one another. To get the geometry of the sphere to correspond to Riemannian geometry, we need to think of those two antipodal points as being the same. And not just those two antipodal points: we have to pretend that any two points that are opposite each other on the sphere are actually the same point. Or, interpret “point” as “line through the origin” (in three dimensions) and “line” as “plane through the origin”. That is, the right model of Riemannian geometry is the real projective plane. #3. Some math popularizers have called the pseudosphere a sphere of imaginary radius. I don’t know what they mean by this, but I do know of something that sort of matches that description. Consider the equation x2+y2−z2 = i2, where the minus sign in the left hand side is no typo and the i in the right hand side is the usual imaginary number satisfying i2 = −1. We can rewrite this as x2+y2 = z2−1, which is the equation of a two-sheeted hyperboloid. This gives us a model of hyperbolic geometry if we interpret “point” as “line through the origin that intersects the hyperboloid” and interpet “line” as “plane through the origin that intersects the hyperboloid”. Compare this with the model of Riemannian geometry described in the previous Endnote. #4. David Corfield points out that my accidental use of the word “pustule” fits in well with descriptions of the parallel postulate as a “blemish” on Euclid’s otherwise “beatiful body”; see Fernando Gouvêa’s review in the References. #5. The writer Lewis Carroll and the mathematician Charles Dodgson, in addition to inhabiting the same body, shared a sense of whimsy; for instance, Dodgson knew about a curious surface called a cross-cap and described it at length in chapter 7 of Bruno and Sylvie Concluded, going so far as to describe a way to construct a cross-cap by sewing together three square handkerchiefs (though, as Dodgson well knew, the final step of constructing “The Fortunatus’s Purse” cannot be carried out in the physical world). The cross-cap is a close cousin of the real projective plane mentioned in Endnote #2, which can be understood as a model of non-Euclidean geometry. So I was astonished to learn from Martin Gardner’s article (cited in the References) that Dodgson didn’t accept non-Euclidean geometry! How could the writer whose Alice books endow space with such plasticity be such a stodgy geometer? Maybe I shouldn’t have been so surprised at Dodgson’s inability to understand the geometric revolution of the 19th century; few English mathematicians at that time kept up with developments on the Continent. Plus, it’s possible that in his Alice books, Carroll was not reveling in the creation of nonsense but rather lampooning nonsense that he saw in the world around him. Given that Humpty Dumpty is portrayed as being scornful and contemptuous of Alice, we might suppose that his pompous dismissal of the rules of ordinary discourse may have been intended as a satiric exaggeration of a kind of demagoguery Carroll hated. In any case, Carroll knew about cross-caps, so he did at least get a glimpse of the wonderland of modern geometry, even if he didn’t understand what it implied about Euclidean geometry. #6. If the name Lobachevsky seems familiar, it may be because of a famous song by Tom Lehrer. Nikolai Lobachevsky, working independently of Bolyai, found his own path to hyperbolic geometry, and while he got there second, he published first. This led some people to suspect plagiarism, and these suspicions inspired Lehrer’s song, but most mathematical historians now believe that Lobachevsky made significant advances even before he learned of Bolyai’s work. #7. The space between the world and the mind that mathematics inhabits nowadays long predates the nineteenth century; as soon as one imagines the counting numbers as a collective with no last element (as the ancient Greeks did), one departs from the realm of the real. But no Greek dared to populate this space as promiscuously as we moderns do. #8. As befits an essay about the way mental constructs can have more than one meaning, there are other meanings that I attach to the pseudosphere icon, but that’s another tale for another time. Eugenio Beltrami, Essay on an interpretation of non-euclidean geometry, 1868. Peter Cameron, Mathematics and Religion. Martin Gardner, Non-Euclidean Geometry. Chapter 19 in The Last Recreations: Hydras, Eggs, and Other Mathematical Mystifications. Fernando Gouvêa, Review of “Euclid Vindicated from Every Blemish” by Gerolamo Saccheri, edited and annotated by Vincenzo DeRisi; March 2015. Evelyn Lamb, Visualizing Hyperbolic Geometry (video). Evelyn Lamb, The Math Wars, Lewis Carroll Style, from Lamb’s Scientific American blog Roots of Unity, March 2014. Evelyn Lamb, A Few of My Favorite Spaces: The Pseudosphere, from Lamb’s Scientific American blog Roots of Unity, March 2017. Henry Segerman and Saul Schleimer, Illuminating Hyperbolic Geometry (video). Interestingly (to me) Byers credits Albert Low, a Zen Buddhist, for much of his own inspiration about mathematics. (I’m behind on my blog reading, so I’m jumping into this like 3 weeks late.) To expand on the “sphere of imaginary radius” thing, to me that is an impressionistic way of thinking about it, not a literally true thing (what would an imaginary radius even mean??? ), but it does seem to give a satisfying symbolic unity to elliptic and hyperbolic geometry. I’ve always found the hyperboloid model confusing, but there’s a nice relationship between the area formulas of spherical and hyperbolic triangles. Each one has a constant K in it that has to do with how curved the space is. For the sphere, it’s K^2(a+b+c-180), and for hyperbolic space it’s K^2(180-a-b-c). I also remember thinking negative curvature would be the inside of a sphere. That seemed very opposite to the outside of a sphere. The radius-circumference thing you mention is not as intuitive to me as something that is very tangible and doesn’t really require one to meditate on what it means for curvature to be an intrinsic property of a surface, which is true and important but I think can be really difficult and abstract if this is new (and even if it’s not!). I imagine setting a piece of paper (tangent plane) on the surface and think about the geodesics on the surface that go through the point of tangency. For positively curved surfaces, the geodesics all bend away from the tangent plane in the same direction. 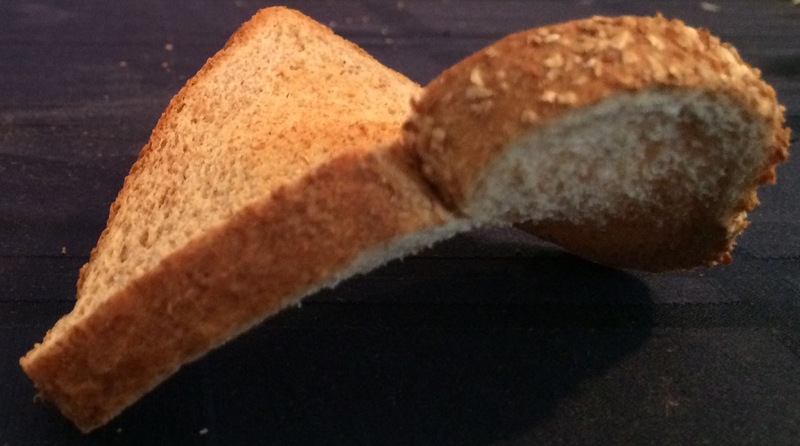 For negatively curved surfaces, some of them bend away in one direction and some of them in another. (And if some of the geodesics stay on the tangent plane, you’ve got yourself a zero curvature space!) Or you can think of it as the paper cutting the surface if it’s negatively curved and not if it’s positively curved. The visual of putting a piece of paper on the surface makes it intuitive and tangible to me. To me the radius-circumference thing is more a consequence of the picture I already have in my mind of negative and positive curvature, but I can see how that notion could help lead into the intuitive picture instead. I’m sure different pictures will appeal more to different people.